This edition is a crime! I managed to get through the first chapter before giving up, having counted ten typos. That's in 12 pages. The typos seem to be the result of the lazy use of optical character recognition (OCR) software, in the main. (No doubt they scanned the text of another edition in.) Montague Faull's name, for instance, is spelled with a double number "1" instead of double letter "l". Then someone ran a careless spellcheck, changing the sense of some of the mis-scanned words. The worst example of this is where the original phrase "The short stranger turned and confronted the party" becomes "The short stranger turned and comforted the party." Hardly sounds like Krag, does it? In terms of text alone, then, I think there are better free versions available on the internet. John Clute provides an eight page introduction, pointing out that the book's initial lack of popularity may have had something to do with its coming so soon after the First World War. The afterword by Loren Eiseley is reprinted from the Ballantine Edition. The best aspect of this new edition is, I think, the cover, which adds a new image to the rather sparse collection of Arcturus cover art. I don't think it was painted specifically for this edition, though. (The only cover credit is for "cover design".) But having said that, Bison Press still manage to spell "Commemorative" with one too many m's on the cover. 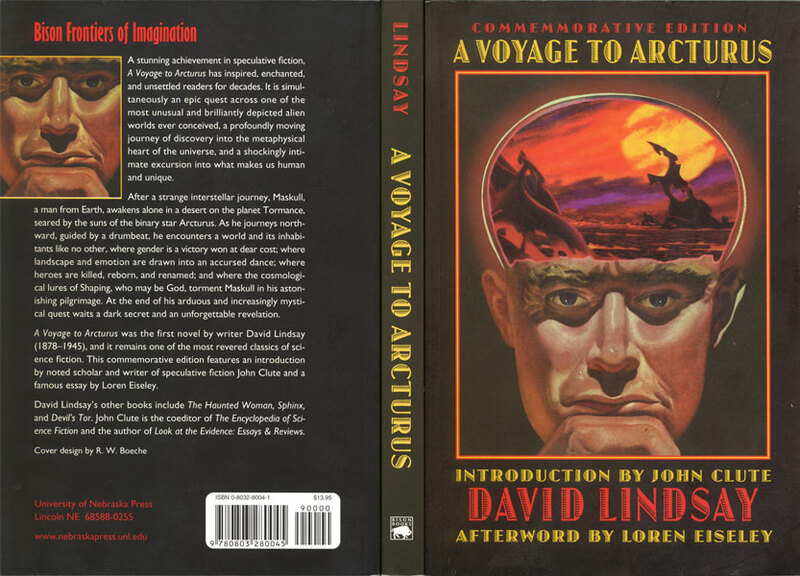 In short, I think if Bison Books/The University of Nebraska Press wanted to commemorate David Lindsay's best book they should have saved some money and put up a plaque or something. They'll certainly win Arcturus no converts with this offering.